The use of estrogens in postmenopausal women is controversial. Fracture rates, however, were significantly reduced with estrogen in all ages, races, with or without progestin. Every study about estrogen, from animal experiments to observational studies to clinical trials, has found that estrogen is beneficial to bone health, including a meta-analysis of 57 trials done before the Women's Health Initiative (Wells G). The bone are stronger as long as estrogen is used. Further analysis of the Women's Health Initiative study has revealed that the side effects are different in women who start estrogen close to the time of menopause, and that some of the problems are due to progestins and not estrogen. A ten year randomized open-label trial from Denmark found reduced risk of cardiovascular disease and cancer in women who were taking estrogen, who started soon after menopause (Schierbeck LL). Also, the KEEPS study from the USA was a randomized and blinded study in women soon after menopause, and there was no increased risk of heart disease or cancer. A large French study showed that the transdermal form did not increase the risk of stroke, so in many women this form is a better choice. Therefore, I think that estrogen is a good choice for women who want to prevent or treat osteoporosis, but it should be started within ten years of menopause and progestins should be minimized. I recently wrote an invited commentary about this for the American College of Physicians, highlighting some of the controversy, because the USPSTF recommended against using estrogens. Women aged 50-59 who took their estrogen (conjugated equine esgrogen 0.6mg/d) for 7 years had significantly fewer coronary calcifications than those who took placebo (Manson). The pie chart shows the degree of calcifications seen on CT scans (the higher the score, the higher the risk of coronary artery disease). Another study looked at the incidence of breast cancer in those women who took the estrogen. There were significantly fewer cases of cancer in these women. It is important to note that they were not taking progestins. These results certainly go against the general teachings that estrogen causes breast cancer. It is the largest randomized controlled clinical trial, but notice that there aren't very many women that were in the study for longer than 5 years because it was stopped early. 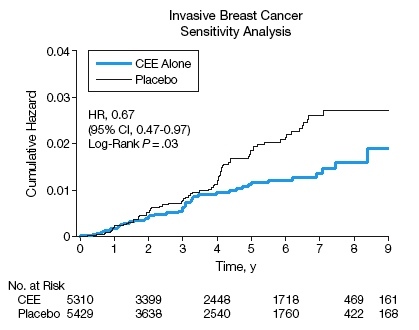 Other studies and observations have found that estrogen is associated with breast cancer, but (as shown below) it is important to distinguish between estrogen + progestin studies and those with estrogen only. Stefanick ML. Effects of conjugated equine estrogens on breast cancer and mammography screening in postmenopausal women with hysterectomy. Jama 2006;295(14):1647-57. Copyright 2006. American Medical Association. All Rights reserved. Used with permission. This graph demonstrates the major findings of the Women's Health Initiative. There were two parallel studies, one using progestin and estrogen in 16,000 women, the other in 10,000 women who had a hysterectomy, using estrogen alone. The first trial was terminated after 5 years due to increased risk of breast cancer. The second was terminated after 7 years due to increased risk of stroke. 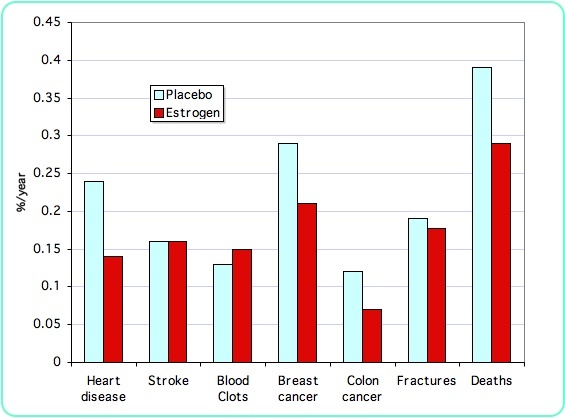 From the graph you can see that in both studies the death rate was the same in estrogen users and placebo users, the rate of fractures was lower in the estrogen groups, and the number of strokes and blood clots was higher in the estrogen groups. The women who took estrogen and progestin had higher risks of heart disease and breast cancer than placebo, but this was not seen when women took estrogen alone. The above graph shows the results from the estrogen-only study in a subset of the women who were age 50-59. None of the differences between placebo and estrogen were considered statistically significant. Overall, therefore, estrogen in young women does not have the same risks as estrogen in older women! The Women's Health Initiative did not address the question about keeping women on estrogen if they have already been taking it for a long time. Conjugated equine estrogens have been used most commonly in the United States, and most of the large epidemiological studies have been done with this form of oral estrogen. Dose-response studies show that 0.625 mg/day of conjugated estrogens give higher increases in bone density than lower doses. A recent study of estratabs showed dose-response between 0.3 and 1.2 mg/d in perimenopausal women. Other forms and routes of administration appear to give similar results in terms of bone density. A paper by Recker showed that estrogen at a dose of .3mg/day along with adequate calcium and vitamin D was able to maintain bone density in women older than 65. Prestwood found benefits from ultra-low doses of estradiol of only .25mg/day. Lindsay R showed that most early postmenopausal women had stable bone density on lower doses (.3 to .4mg/day conjugated estrogens). Also, Johnson SR found that ultra-low dose transdermal estradiol (.014mg/d; brand name Menostar) did not cause abnormal endometrial hyperplasia in a 2-year study; another study found that bone density was better than with placebo (Ettinger B). The ultra-low dose works best in women whose own estrogen levels are not completely gone (Huang AJ). The transdermal estrogens do not pass through the liver in high concentrations. Therefore, they are less likely to cause blood clots. On the other hand, they also do not cause improvement in the HDL cholesterol. The choice between these two routes of administration may depend on personal preference and lipid profile. Notice that oral contraceptives contain ethinyl estradiol in doses that typically range from 25 to 35 micrograms a day, which is the appropriate estrogen dose for a young woman. Epidemiological studies have suggested that the maximum prevention of fractures occurs in women who started estrogen within 5 years of menopause. Theoretically it would be beneficial to give estrogen right at menopause to prevent the perforation of plates in trabeuclar bone, with disruption of the trabecular architecture. Once the trabeculae are broken, they may not reconnect again, and bone strength may not be gained even if bone density increases. These high-resolution MRI images of the tibia of normal women followed for 2 years after natural menopause show trabecular plate perforations (arrows) that were not seen in women who took estrogen replacement (Wehrli FW). In older women, estrogen increases bone density as well as bisphosphonates, and estrogen prevents fractures. However, as discussed above, there is a greater risk of starting estrogen in women who are more than ten years past menopause. Therefore, it would not be a first choice medication for osteoporosis in older women. Progestins have been given to women who still have a uterus, because estrogen alone can increase the chance of endometrial cancer. However, in view of the recent studies showing increased risk of breast cancer and heart disease in women taking combination hormone therapy, the entire set of previous recommendations must be reconsidered. Progestins have several side effects, including bloating and depression. The beneficial effects of estrogen on the serum lipids are reduced with progestins (not as much with micronized progesterone as with medroxyprogesterone) as shown in the PEPI study (Barrett-Connor, E.). A study (Schairer C) of 46,355 women followed for an average of 10 years, during which time there were 2082 cases of breast cancer, showed that the overall risk for breast cancer was 3.9% per year in women not using hormones, 4.5% per year in those using estrogen, and 5.8% per year in those using both estrogen and a progestin. Another study of a million women from England (Beral V) shows significantly more cases of breast cancer in women taking combination estrogen and progestin than in women taking estrogen alone. The risk per 1000 women over ten years was 5 extra cases of breast cancer from estrogen alone and 19 extra cases with combination. Million Women Study Collaborators, Lancet 2003; 362: 419�27, used with permission. 3] to take long-cycle therapy (estrogen every day and progesterone for about a week every 3 to 4 months). Many physicians do not realize that estrogen improves the bone density as well or better than alendronate. 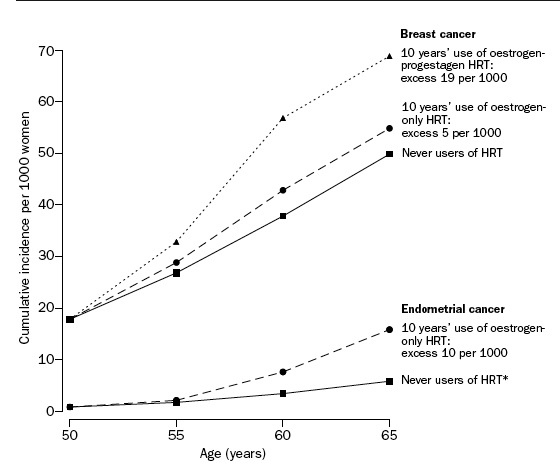 Below is a table of bone density results from randomized trials comparing estrogen to bisphosphonates, and a graph from the study in women younger than 60 (Ravn). There are additionally dozens of studies in postmenopausal women showing that estrogen improves bone density better than placebo or calcium. Nelson HD, Rizzo J, Harris E, et al. Osteoporosis and fractures in postmenopausal women using estrogen. Arch Intern Med 2002;162(20):2278-84. Copyright � 2002 American Medical Association. Used with permission. This study followed women for ten years. There were 373 women who had been taking estrogen continuously, with an average of 24 years at the beginning of the study. 926 women were currently taking estrogen but had not taken it since menopause, 1540 had taken some estrogen in the past, and 5977 had never taken any. This shows that estrogen remained beneficial for 34 years. There is no comparable data on any other osteoporosis medication.